Alice chillin' in class. April 2012. So yesterday's Mommy & Me class was amazing. Like I said... it felt so good to talk to and connect with moms going through the exact same thing at the exact same time as me. 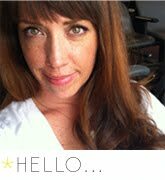 I mean, talking to other moms who have kids that are now older is helpful, too, but it just isn't the same as hashing it out with someone who is currently in the newborn trenches with you. After our class was finished, I felt more normal. More sane. More like Hey, this just might work out. Because, honestly, I had a few days back there where I was like What the eff have we gotten ourselves into?! And I'm pretty sure Alice and I will come away from this 8 week class with a bunch of knowledge, some new friends and a boost in confidence. Speaking of knowledge, I may have just learned a life-changing gem yesterday. Let me introduce you to something called the Isis Super Swaddle. This, my friends, is like a newborn straight-jacket. Now I know they make specific products that recreate this womb-like swaddle but we are up to our ears in baby items and we don't need any uni-taskers taking up space. Our instructor showed us how to do this Super Swaddle in class and I was skeptical but optimistic. When she told us that babies most often wake in the night because they Houdini their hands out of their swaddle and, lo and behold, it starts the rooting cascade as they gobble on their fingers. Imagine if you kept their tasty hands and yummy fingers glued to their sides during the night so that the hunger cascade doesn't begin prematurely but when they are actually hungry. After Alice's waking-every-one-and-a-half hours the previous night I thought, What the hell? and vowed to try it out. You guys. She slept 4 hours between both nighttime feedings. And she didn't get her hands out of the swaddle at all. It's an effing miracle. Maybe it was a fluke or maybe it was the Super Swaddle that kept her asleep. Who knows. All I know is that I woke up feeling rested and thanking whoever invented that newborn straight-jacket of a swaddle because it got me some much needed sleep. You know, three and a half hours at a time. Place baby at the top of a large square blanket (like this one) so that the blanket is behind the top of their shoulders. Take the left corner and wrap it across baby's body, tucking it over and under the opposite arm. Repeat with the right corner, tucking the blanket under baby's body. Baby will look like she's in a straight-jacket with a mermaid tail. Take a photo to use later as blackmail, especially if baby is screaming. Take both ends of the mermaid tail and twist it in a clockwise motion until you've gone around twice. Take the twisted mermaid tail and bring it up to baby's chest and make a wide fold with the remaining fabric so that it lays across baby's swaddled arms. 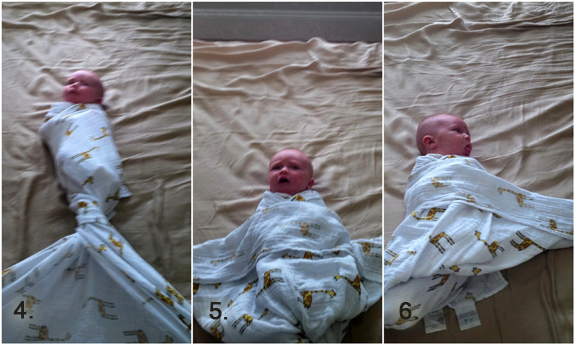 Roll baby to one side and tuck the fabric under baby's body so that it joins up with the other side. Take those two pieces and tie a knot so that the knot lays on the side of baby's body. Voila. Baby is super swaddled. Please excuse the poor iPhone quality of these photos. I had to move quickly as Alice was not stoked to be going into the Super Swaddle but once in there, she's as happy as a clam in a straight jacket. 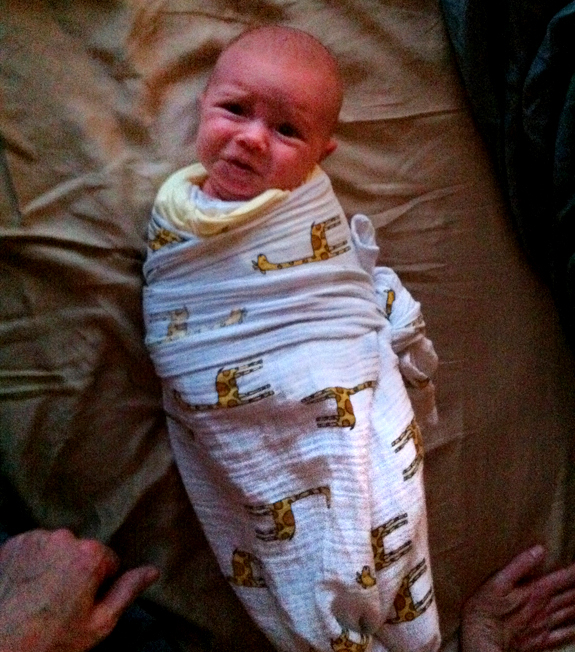 If you have a baby that you're still swaddling, you should try the Super Swaddle out tonight. Up until last night, we had been doing Dr Karp's swaddling technique and Alice always managed to wiggle her hands out and I'd find her sucking madly on them when I'd get up for nighttime feedings. Let's hope she doesn't figure out how to get outta this one! 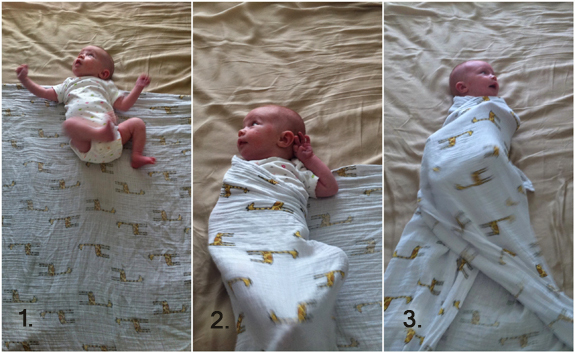 Any other swaddling tips? Have you tried the Super Swaddle? I really really REALLY hope this swaddling technique helps Alice sleep a bit longer and more soundly. Mommy needs it! Fingers are crossed! my friend swears by that thing! her daughter wasn't sleeping at all before it. She is too cute!! I love seeing pictures. At AVH, many nurses did a swaddle one way, and then your new way. I love doing it the new way you have just learned because it is harder for them to creep out. I wish I could put Adriana in a swaddle still to keep her asleep at night... nope, that doesn't look likely!! On baby, and a quick zip up! Until he was about 3 mos old! We use the Miracle Blanket for easy swaddling, but I'm totally going to try this too (especially when the Miracle Blanket is in the laundry.) 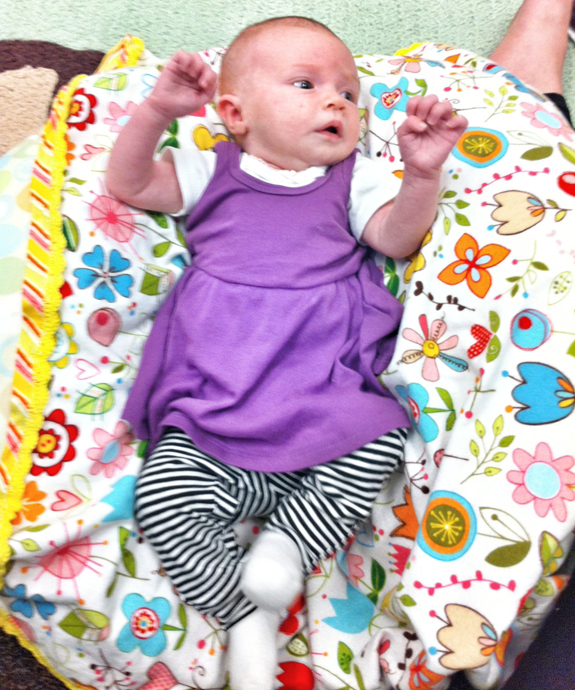 Our little Houdini can get out of a traditional swaddle, but this look so much more secure.